Warren Buffett might as well be king of the investment industry. He produced the best returns the world has ever seen working from his house in Omaha, not a desk on Wall Street. And for that reason, so many people want his advice on how to invest for retirement. They want to hear from someone like them — someone who doesn’t spend every waking moment in Manhattan. At the 2004 Berkshire Hathaway (NYSE: BRK-A ) (NYSE: BRK-B ) shareholders meeting, Buffett was asked by one investor if he should buy Berkshire, invest in an index fund, or hire a broker. An index fund? That’s what the best stock picker in the world recommends? So, let’s get to the specifics. What’s Buffett’s favorite index fund? “Just pick a broad index like the S&P 500. Don’t put your money in all at once; do it over a period of time. Why is Buffett so keen on index funds? They’re cheap. In fact, Vanguard’s S&P 500 ETF (NYSEMKT: VOO ) provides a way for investors to own a slice of 500 of the largest businesses traded on the public stock markets, including Berkshire Hathaway, at a cost of just 0.05% per year. 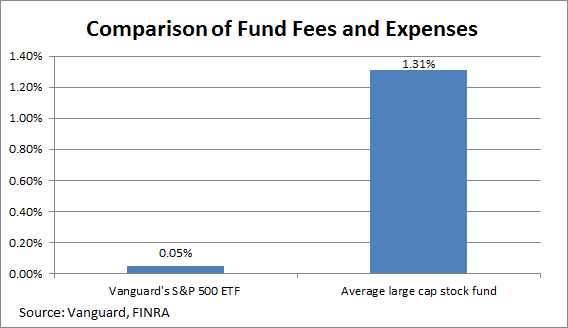 On a $100,000 investment, fees would tally to only $50 per year, compared to $1,310 for the average large-cap mutual fund. EDITORS NOTE: Over the years,VTI has performed about 1 percentage point better than S&P 500 ETF. Add in Vanguard’s other popular ETFs, like its Vanguard FTSE All-World ex-US ETF (NYSEMKT: VEU ) fund, which tracks international stocks, and its Vanguard Total Bond Market ETF (NYSEMKT: BND ) for bond exposure, and you’ll have a more balanced investment portfolio than many who hire the help of a broker. The one thing I will tell you is the worst investment you can have is cash. Everybody is talking about cash being king and all that sort of thing. Cash is going to become worth less over time. But good businesses are going to become worth more over time. Of course, that’s not to say that having a cash buffer for emergencies is a bad thing. However, having piles of cash — tens upon tens of thousands of dollars in cash — is a great way to guarantee a terrible return on a very large pile of money.